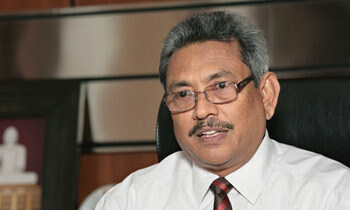 Former Defence Secretary Gotabhaya Rajapaksa today denied allegations of any connection with the Bodu Bala Sena (BBS) or the recent attacks aimed at Muslim owned shops. In a facebook post, Rajapakse strongly condemned the false rumours linking his name with the BBS and Justice Minister Wijeyadasa Rajapakshe in connection with the atrocious burning of Muslim owned shops in the recent past. “I strongly deny such allegations and decry the attempt to tarnish my reputation once again. We need to have the wisdom to understand the political agenda behind such conspiracies and rise as one nation against such despicable acts aimed at inciting racial disharmony,” he said. Gota, were you not a prominent partaker in their meetings when your Bro held the reins and you were the Defense Secretary. Please do not be ungrateful, Gota contributed immensely to end the war. If we are living without fear psychosis, that is because of Gota. "Paw Aney" this poor fellow did not know anything about white vans, Mig deals, assault and murder of journalists and all crooked deals about the former royal family. Has RW opened any BBS offices? Attended any BBS event? When in power, GR turned a blind eye and encouraged every word and action of the BBS. He allowed them to be who they are today. GR and company played religion to their own benefits. This is the baby they fed and nourished and now a real problem for all peace-loving Sri Lankan who want to live in harmony with all. It is common sense. How the BBS was dancing during previous regime.Why GR not arrested him because he was behind him.Now WR joined hands with GR freeing BBS to do anything they want. Better President must take over the Police Department and control the Defence Ministry. A prominent politician brought to ground. Poor administration of siblings. Agree Mevan, but please do not use the word royal family, cockroaches are not royal. Idiots only dance for the music these kind of politician's play. Tell me an instance when he owned up anything. BBS is a creation of Yahapalanaya. Think logically. Who gained and who lost due to BBS actions? Ghanasara is the main actor of this secret drama. Just what Jomo Kenyatta said of his Mau Mau! Very true. And they know where the funds for BBS comes from. If GR was in connection with BBS, Yamapalakas would have gone to town with it by now. Its wrong to point finger at anyone unless there is a proper evidence. People want to drag this man for any failures of the government. This gvt is afraid of Estern province Wahhabi thugs who are not allowing CEB to give the electricity power to Sinhalese living in Eraur .First arrest those Wahabi thugs and then arrest the people who are going against this extremist activities happening in Eastern province.